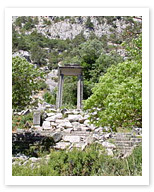 Telmessus is the ancient name of the modern-day town of Fethiye. Walking around the town, you will see a few Lycian sarcophagi left untouched by robbers who took much of the city’s wealth, as well as what’s left of a 6,000-person stadium. The Tomb of Amyntas, a Doric temple that dates from the 4th century BC, is meticulously carved into the side of a cliff above the town. Of course, when someone says there’s a site near a “cliff,” you should probably expect a bit of a hike, and this is certainly no exception, so be prepared. Anyway, the walk is good for you, the air is pleasant, and the view is well worth the effort.